Photographs Copyright © 2002 by Jeffrey L. Thomas. Above: approaching the castle from the path leading from the town. 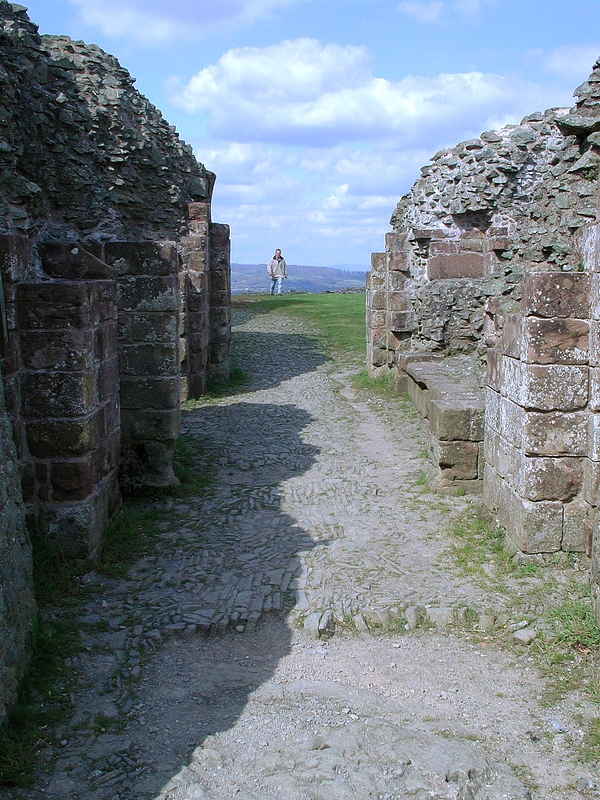 Below: view of the main gate passage from the middle ward to the inner ward of the castle. 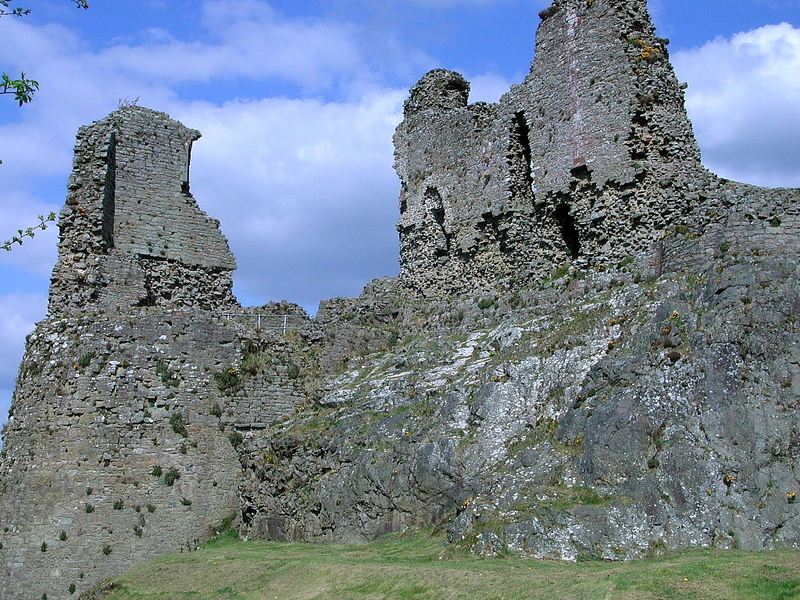 The castle at Montgomery succeeded the motte-and-bailey castle at Hen Domen one mile to the north-west, after 1223. It was far more strongly sited, on a steep rocky ridge running north-south, reflecting changing military fashion. The tower at Hen Domen may have been retained to cover the Severn Crossing at Rhydwhyman, not visible from the new site. 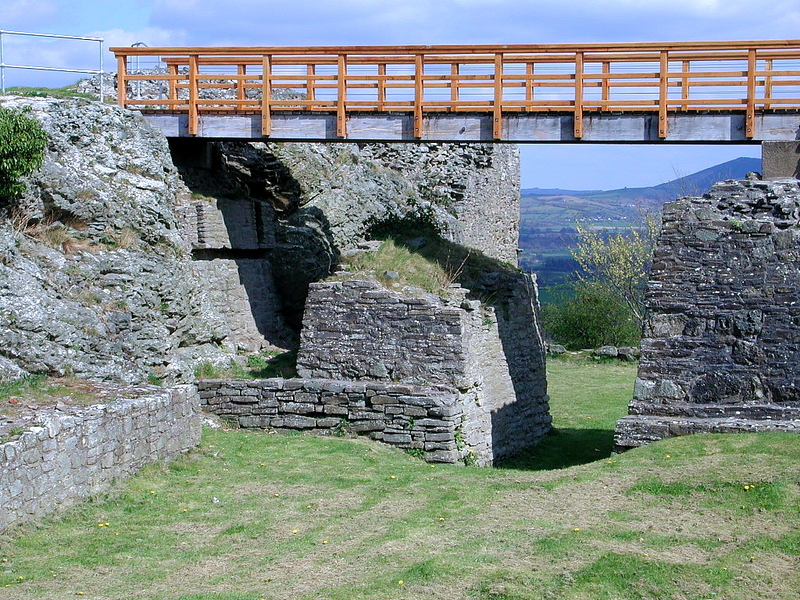 The new castle was built during Henry III's campaign against Llywelyn ap Iorwerth, in whose hands Hen Domen had been left, but whose fidelity had been rendered questionable by his siege, early in 1223, of Builth Castle. The new site consisted originally of the inner ward at the north end, constructed in stone between 1224 and 1233, and the middle ward to the south, built in wood at this time and converted to stone only in 1251-3. Outworks to the south, the outer ditch of which is occupied by the house left of the path from the car park, were probably added in 1233 and embellished in stone later. 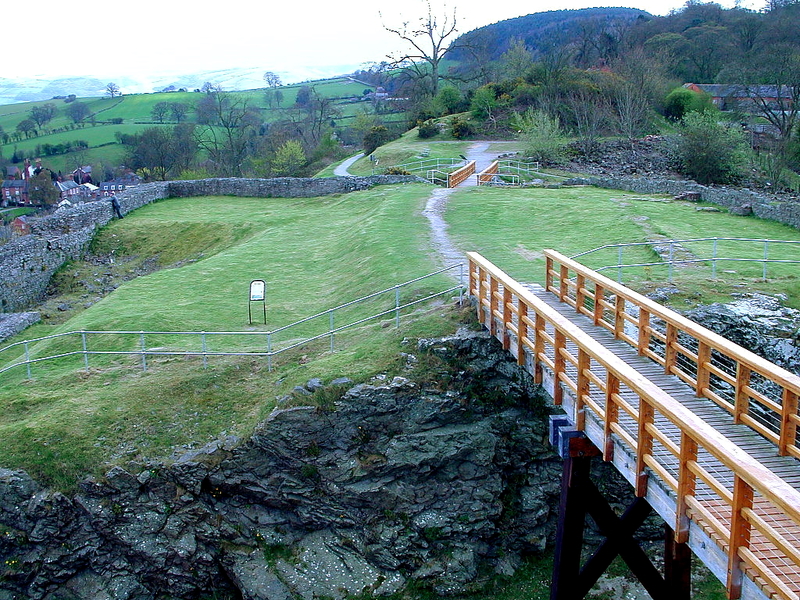 A modern wooden bridge on the site of an earlier drawbridge, crosses the rock-cut ditch into the middle ward, and a further bridge crosses another ditch into the inner ward. The crossing was defended by a gatehouse with two round towers, an early example of the type, much of the ground floor of which survives. Each tower contains a rectangular room, not originally accessible from the gate passage, although a doorway was later provided into that on the west, which might have initially been a prison. 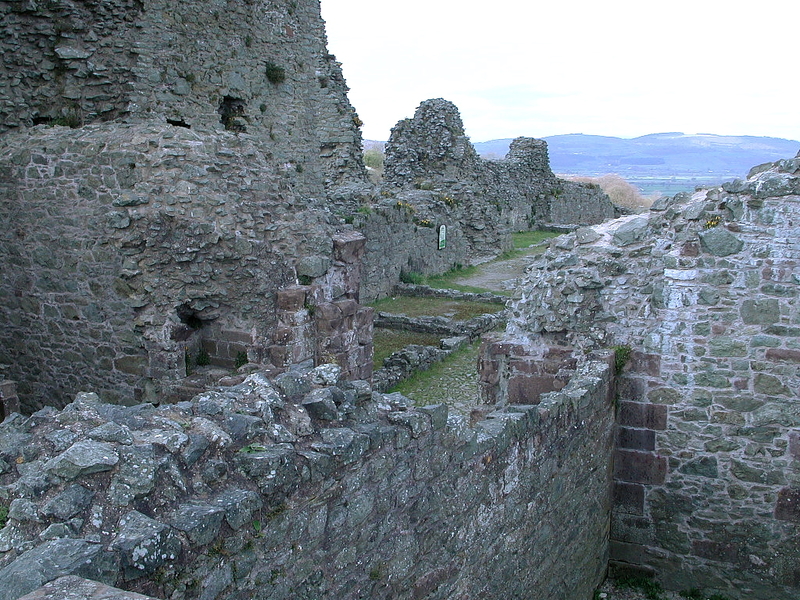 Below: view of the inner ward from the gatehouse towers towards the kitchen & brew house. 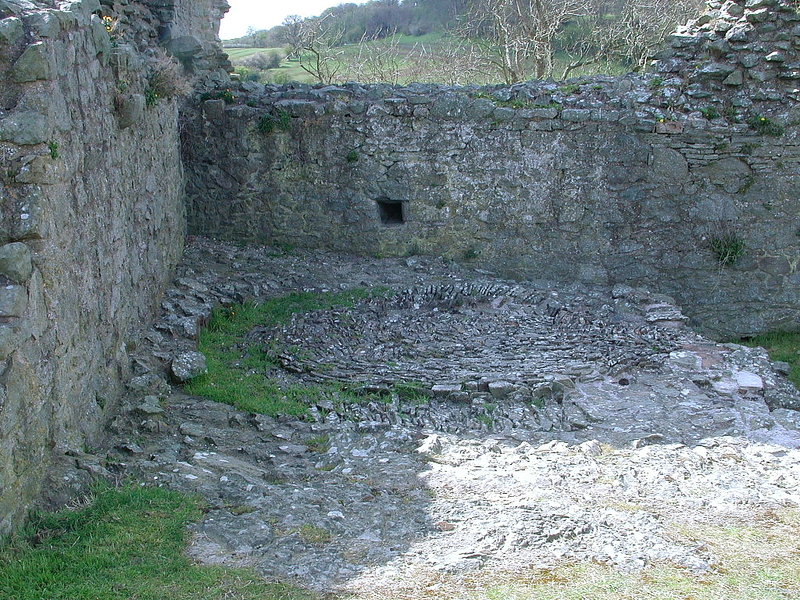 The room on the east, from which the drawbar across the gate would have been operated, is entered from the courtyard beyond and is notable for the number of masons' marks scratched on the stonework. Something of the upper floors can be reconstructed from historical records; a wooden chapel supported on two posts straddled the back of the entrance passage, and both this and the three upper floors of the gatehouse proper were reached via a stair from the courtyard. The two uppermost floors contained private apartments, while the first floor was a single room. 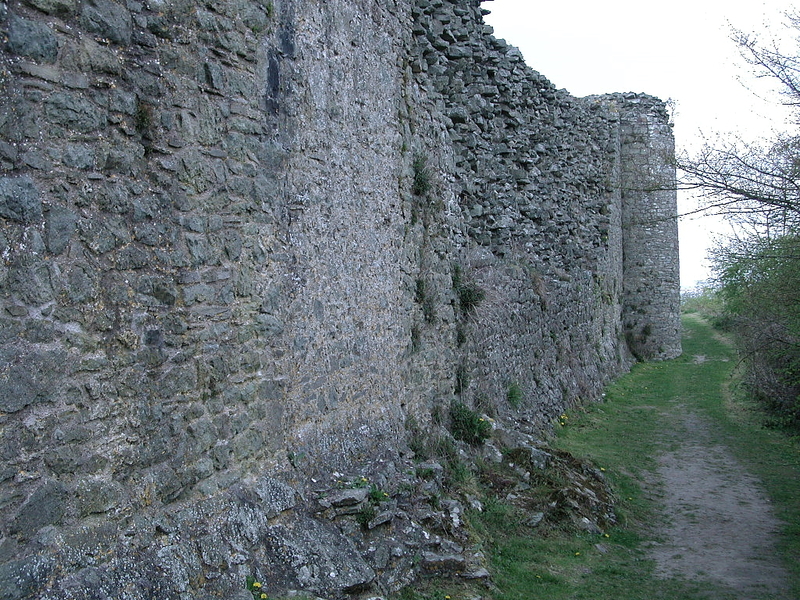 The remaining inner ward defences consisted of a curtain wall with a short-lived tower on the north, and a larger tower, containing the well, on the west. This tower was built over the precipice along this side of the castle, which, together with seepage from the well, caused repeated structural problems; it was totally rebuilt in the mid-14th century. 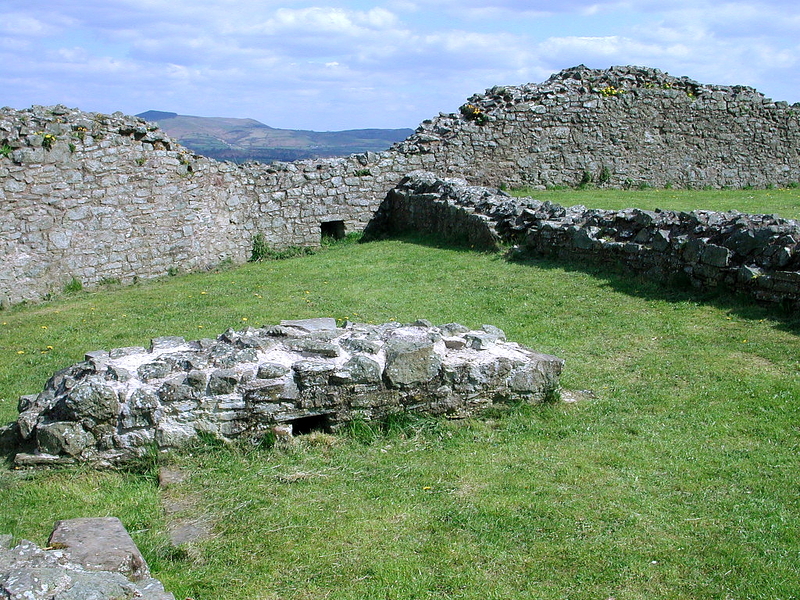 Buildings nestled against the inside of the curtain wall; the bakehouse (with its large bread-oven) and brewhouse on the north-west appear to be part of an early plan, but almost the entire circuit was later filled with structures on several floors. The middle ward too shows traces of the buildings which would have lined it, although it was later levelled up to support a fine half-timbered mansion with brick infilling built by Sir Edward Herbert in 1622-5. 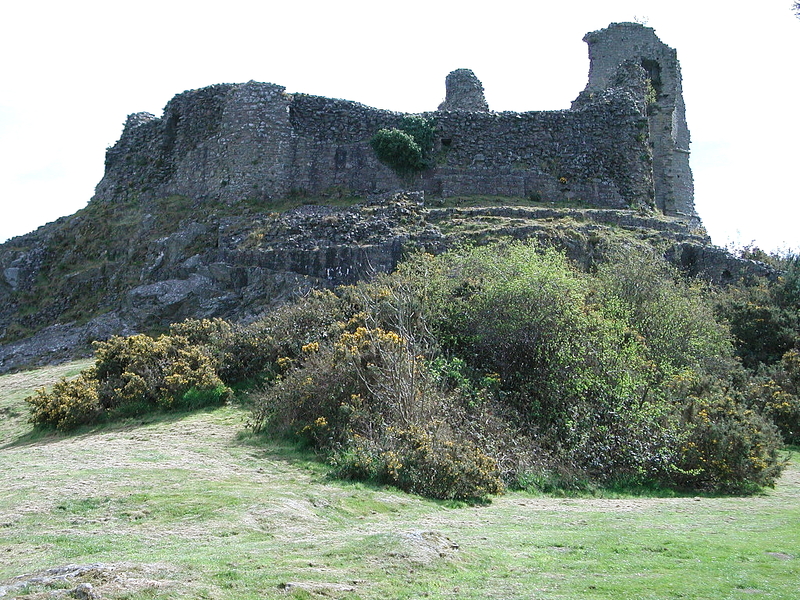 Below: view of the rear (northern end) of the castle resting on an impressive outcropping of rock. The town, in the hollow to the east of the castle, was not properly defended for some years after its foundation in 1223. The earthworks and palisade eventually built passed to the west of the castle, providing a further line of defence. The castle survived attacks by Llywelyn ap Iorwerth in 1228, and in 1231, when the town was burnt, and by Dafydd ap Llywelyn in 1245. Llywelyn ap Gruffydd's work on Dolforwyn Castle four miles to the south-west, begun in 1273, helped to precipitate Edward I's successful 1277 campaign, after which the town walls were rebuilt in stone in 1279-80. Construction on the castle in 1283-8, after the final settlement of 1282, included a new hall, kitchen, chamber, bakehouse and granary. Peace reduced Montgomery's strategic importance, and by 1343 parts of the castle were already in disrepair. It was refurbished by Roger Mortimer, second earl of March, after 1359, and again under Henry VIII during the 1530s and 1540s. It last saw action under the Herberts during the Civil War, when it surrendered to the Parliamentarians in 1644; in 1649 it was demolished, along with the recently built mansion in the middle ward. 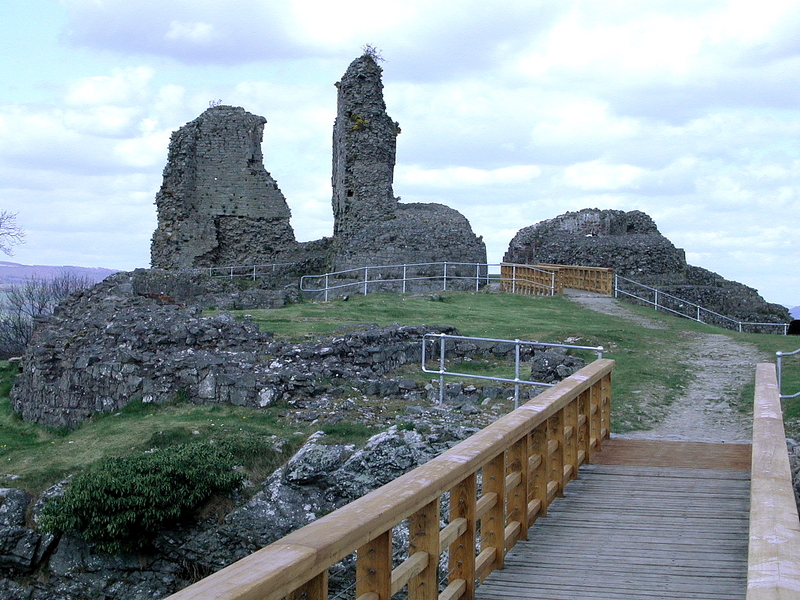 Western view of Montgomery Castle from the ditch below.